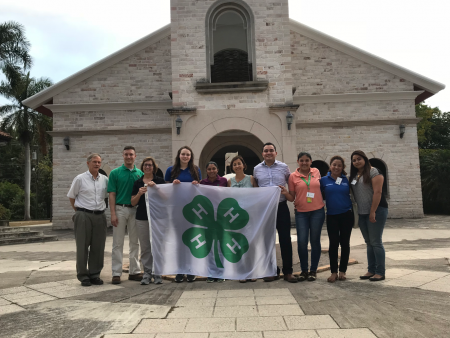 Sally McClaskey and Dustin Homan (Ohio 4-H Program Managers), and Amanda Morgan (OSU Undergraduate and Collegiate 4-H member) visited Zamorano University and nearby communities in Honduras in March, 2018. The purpose of the visit was to initiate a partnership between Zamorano and Ohio 4-H in order to explore how 4-H programs and methodologies might be adapted to positively engage youth in Honduras. Jorge Salgado, Research Associate at OARDC, initiated the connection after he served as an expert reader for the Ohio Youth Institute because he desired to see a similar program facilitated for the youth in his home country. The visit included presentations about 4-H; school tours and presentations; and discussions with secondary school administrators, classroom teachers and Zamorano administration. Proposed next steps for the partnership include: a workshop to begin training adults interested in starting 4-S clubs (the Spanish translation of 4-H), piloting a Honduran Youth Institute modeled after the Ohio Youth Institute, connecting Ohio 4-H and Honduran 4-S clubs, recruiting Ohio youth and adults to attend a leadership camp at Zamorano, and translating 4-H materials into Spanish for use in Honduras.